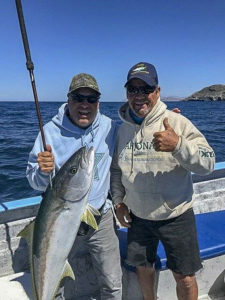 Editor’s Note: Gary Graham has rounded up the latest weekly sportfishing report from around Baja’s hot spots in Mexico. Things are heating up and the fishing is turning on. Bluefin tuna to 200-pounds have been found lurking offshore just below the border. Cedros yellows are frolicking in the lee, just in time for June. 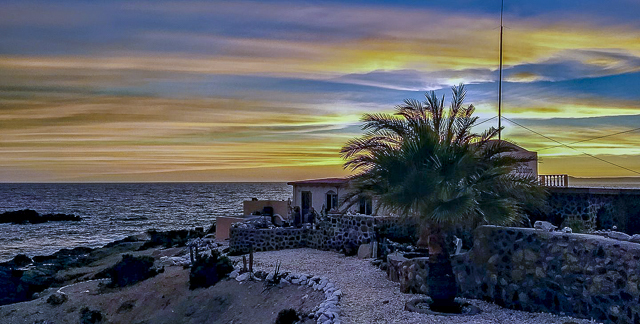 Sea temps are climbing in the Sea of Cortez to 75-degrees as sardina settle in at Loreto and below all the way to Cabo. 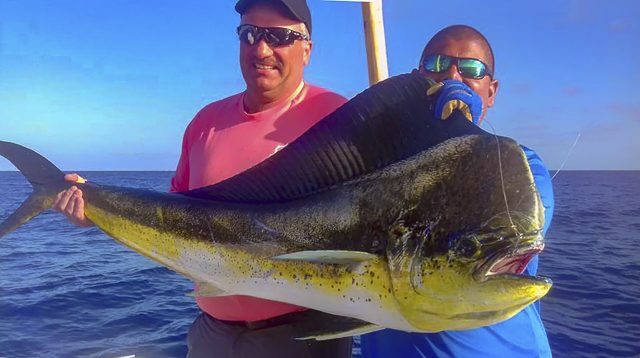 Big roosters, dorado, wahoo and yellowfin tuna compete for attention inshore and offshore double-digit releases continue for striped marlin and the first of the big blacks and blues begin to filter in. 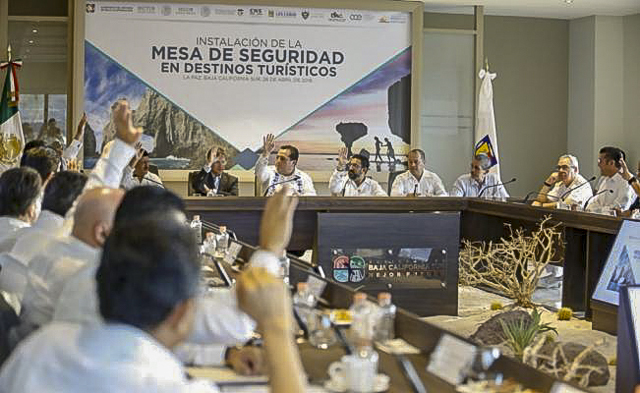 Baja California Sur, Mexico — The Secretary of Tourism, Enrique de la Madrid Cordero, announced that state and federal public security institutions are having spectacular results in the recovery of security levels in La Paz and Los Cabos reducing the monthly homicides from 122 last October to 12 during the month of April. Pretty slow this morning. Bass fishing was off, even with the anchovies. About all that was biting were tree fish, johnnie bass, and other assorted mixed rockfish from the Drop-off. Water conditions have improved around the Islands, and there are some 15- to 25-pound yellows biting. The weather side of North Island is seeing some of these larger ones. Boats are sitting on the anchor, running chumline and getting these quality yellows to bite the fly-lined sardine or mackerel as well as the surface iron. Though smaller, there are also yellows in the Middle Grounds, the Lighthouse Kelp and below the Islands from SKR to the Rockpile. This is the zone were most of the big bluefin are being found. Many of those are coming on the kite with the yummy flyer or the double-trouble rig. For the guys fishing the fly line sardine or the Flat-falls, the bite is slower with a few exceptions. This is not to say the kite bite is wide open though. Today most of what the guys are seeing are huge fish from 100- to 200-pounds. We know that the Tomahawk has at least three running from about 130- to 180-pounds. The bluefin are in the colder side of the temperature break and down 50- to 200-feet. They come up on the tide swings. The 230 Area is in the lower middle of this triangle. This zone still has some signs of bluefin — mainly up near the 371. There are also some yellowtail around, some in schools in open water and some on kelps. Neither the bluefin nor the yellowtail want to bite as they are all stuffed full of micro bait. Anthony reported in; chased bird schools all day long at Punta Banda for limits of yellowtail. Tady 45 surface iron in mint color was the ticket. Pangeros @vonnys kept us on the fish all day. We also had some white sea bass (10 to 15-pounds) and red vermillion (5-pounds) mixed in. Overall, trips were legit! We got blown out on Friday though!!!! 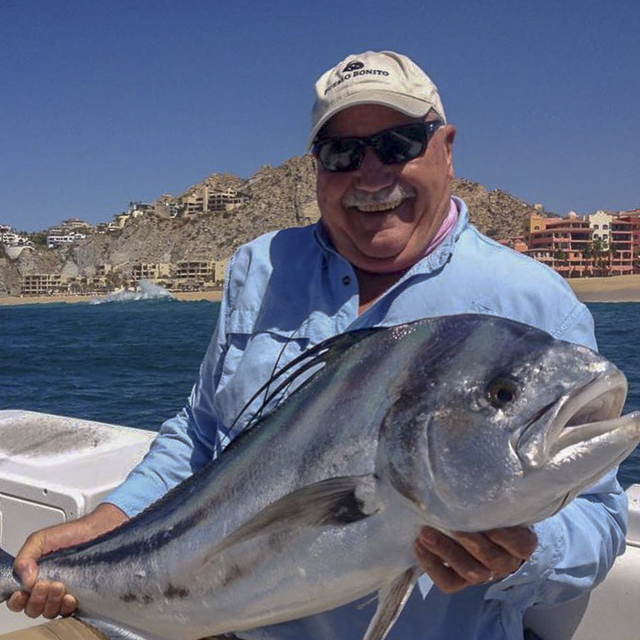 Locals seem to be spending most of their time on Sea of Cortez fishing. 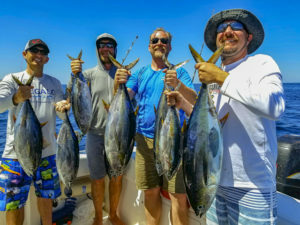 Yellowtail fishing has been outstanding. 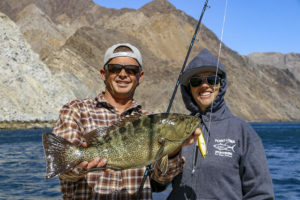 The fish have been on the high spots along the South end of the island all winter and biting well the Flatfall fall Jigs and trolled Rapalas. Well now, a big group has decided to move up the front side and position right outside of town, just like last year but one month earlier. It didn’t happen until July last year. We had an excellent trip to my favorite spot, Bahia de Los Angeles. 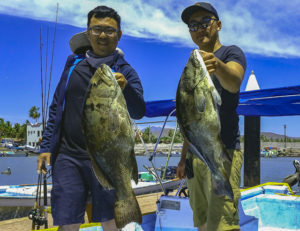 There were five guys in our group; we fished with both Joel, Sr. and Joel, Jr. Prieto on Monday 5/21 and Tuesday 5/22. We were there this last weekend during the Pesca de Baja tournament. We fished Friday, Saturday, and Sunday but didn’t buy in. Roads were all normal and okay, except two two-mile stretches just before Puertocitos where all the vados are. They have major equipment and are doing complete new roads. Should be nice when they are done. Dirt was fine. Photos of sunsets, sunrises, and walks on the beach, just guessing but fishing must still be slow. The water temperature has finally hit 75-degrees, and the cabrilla are starting to get rolling. The problem with catching the hungry cabrilla has been getting the sardina down past the marauding schools of firecracker-sized yellowtail! up. Friday was exceptionally busy with limits, catch and release and heading back to the beach by 9a.m. Yes, we had one boat done by 9 a.m. and many back by 11 a.m.! The firecrackers were a little less troublesome out at Carmen Island’s “La Cholla” where cabrilla averaging 15-pounds were put on ice. It’s time to start seeing and catching striped marlin with the water warming up. After that, we should start seeing dorado in close to the islands. 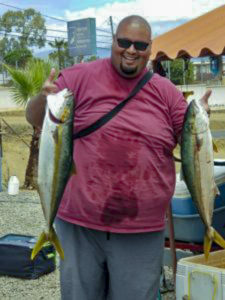 Yesterday we saw a couple of nice dorado hit the dock. Both dorado were in the 40+ pound range and were a very welcome sight. One was landed on the mahi mahi and the other on the Pez Vela. 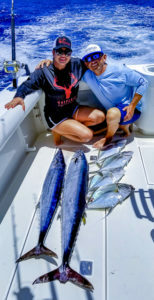 Both were hooked while trolling for marlin and are pictured below. We hope this is the first sign of a good dorado bite — stay tuned. The weather has started to get as hot as the fishing on the East Cape. Conditions have been near perfect with the exception of a few windy days here and there. Tuna, tuna, tuna!!! The tuna fishing continues to be red hot. Almost all boats willing to make the run outside to find porpoise have been coming home loaded with yellowfin tuna. Billfish are also being found outside with striped marlin, sailfish and even a swordfish being caught this week. Most boats were filling the fishholds with tuna but those that put time in trolling were rewarded with multiple billfish strikes. Furthermore, those that ran to the south in search of marlin released upwards of 6 to 7 marlin a day. sporadic, but we should start seeing more dorado soon. Things also picked up close to shore. Wahoo are starting to roll in. Pompano, snapper and roosterfish action was also excellent this week. Live bait, especially, sardina were the ticket for action. hottest boats. Visit www.scorpionsportfishing.com for more info. As always, follow Scorpion Sportfishing and El Regalo Sportfishing on social media for all the latest on East Cape fishing. A three “good” week: Good, Good and Very Good! Yellowfin, marlin, dorado, wahoo, roosterfish, and pompano were all biting. The water temperature around the corner on the Pacific is cooler, in the upper 60’s, while in the direction of San Jose del Cabo and to Los Frailes, the ocean currents were averaging 78 to 80-degrees. Still unpredictable currents pushing in off colored, murky water into areas north of Punta Gorda where water temperatures are warm, and clarity is varied. Large schools of mullet moved in along the shoreline, particularly in the Puerto Los Cabos Marina area and along both sides of the jetties. Sardina are being found just north of the jetties, though they are starting to be a bit more scattered and limited, as larger surf conditions are becoming more prevalent. Other bait options included caballito, small jacks, chihuil, sardineta and even some mackerel were found offshore. Also reports of some sizable schools of bolito found on offshore grounds, always an encouraging sign that pelagic gamefish are usually closely following this preferred food source. 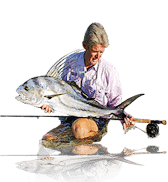 Charters targeting these offshore grounds have been reporting multiple striped marlin shots daily, trolling lures and dropping back baits, also soaking baits. The yellowfin tuna bite was mainly centered at La Fortuna, the Twenty Five Spot, some days near Iman and San Luis Banks. Most of these fish were in the 30- to 70-pound class, but few anglers were fortunate to land one of them. 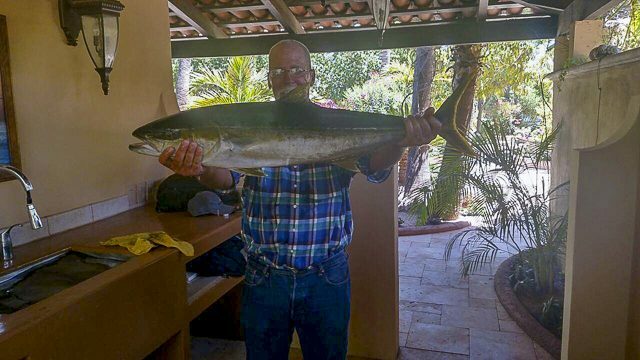 Very few dorado are now being reported, though more of these fish were seen recently. Inshore rock piles seemed to produce better all-around action for a variety of excellent-eating species, most of these under ten pounds, with an occasional larger specimen. 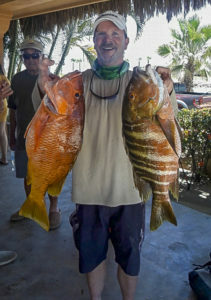 Anglers using sardina or chunks of other baits were finding yellow snapper, leopard grouper, barred pargo, spotted pink snapper, island jack, pompano, amberjack, sierra, triggerfish, surgeonfish, and others — a virtual smorgasbord. Numbers at a glance: Billfish 55%, tuna 25%, dorado 2%, other species25%. We are starting to get excited about the June season here in Cabo. Things have really picked up in the last few weeks. Most of the boats are heading for striped marlin, with up to 6 striped marlin caught per boat in one day, but tuna and other smaller game catches have been equally good. The roosterfish are here now, making for a lot of fun fishing, with some boats catching up to 9 of them per outing! Jack crevalle, amberjacks, grouper and sierra mackerel, have been the majority of our “other” species caught. 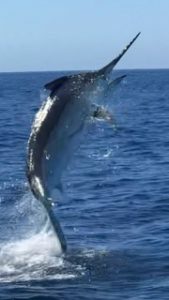 And let’s not forget about our almost 700-pound black marlin hooked this past Sunday; all signs of an exciting June tournament season, kicking off with the Pelagic Cabo Summer Slam this next week and the Stars and Stripes Tournament at the end of the month. LOCATION: Destiladeras, Chileno, Old Lighthouse, Herradura. WEATHER CONDITIONS: Beautiful sunny skies and moderate/calm waters. Some wind picked up in some areas. AVERAGE WATER TEMP: Water temp varied from an average of 74F to 86F from East Cape to the Pacific. BEST LURES: Caballito, mackerel, cedar plugs, feathers. Headed to San Carlos in June for the first time. 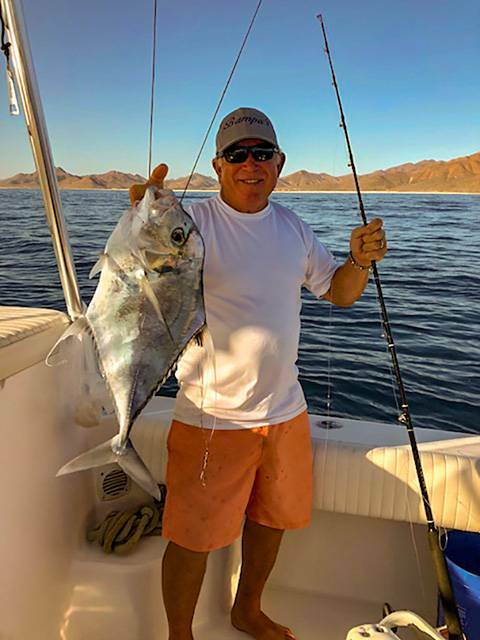 I have fished East Cape, Loreto, Cabo — all of Baja. I’m hearing San Carlos is a bit fishy, though not as fishy as East Cape or is that wrong?